Have you ever taken on a month long challenge? Maybe it was to become more fit, drink more water, or participate in Inktober. Challenges are powerful for all realms of life and the same is for art. We are going to share some of our favorite art challenges, share some of the backstory of Inktober, and tell you the benefits of an art challenge and why you should make challenges a part of your life! Lee: Working on some fun little promos for his agent, and he is getting feedback and having different publishers look at one of his books. Will: Just submitted the second round of sketches for Bonaparte Falls Apart. Jake: Super busy with Inktober! Inktober now has several sponsors, which takes a lot of administrative work, looking over contracts, and providing content for them. Also, he shipped Skyheart, went to New York and talked with editors about working on future projects, and built friendships and connections. Reminder: Svslearn.com, is an online illustration school, and a sponsor of Inktober! 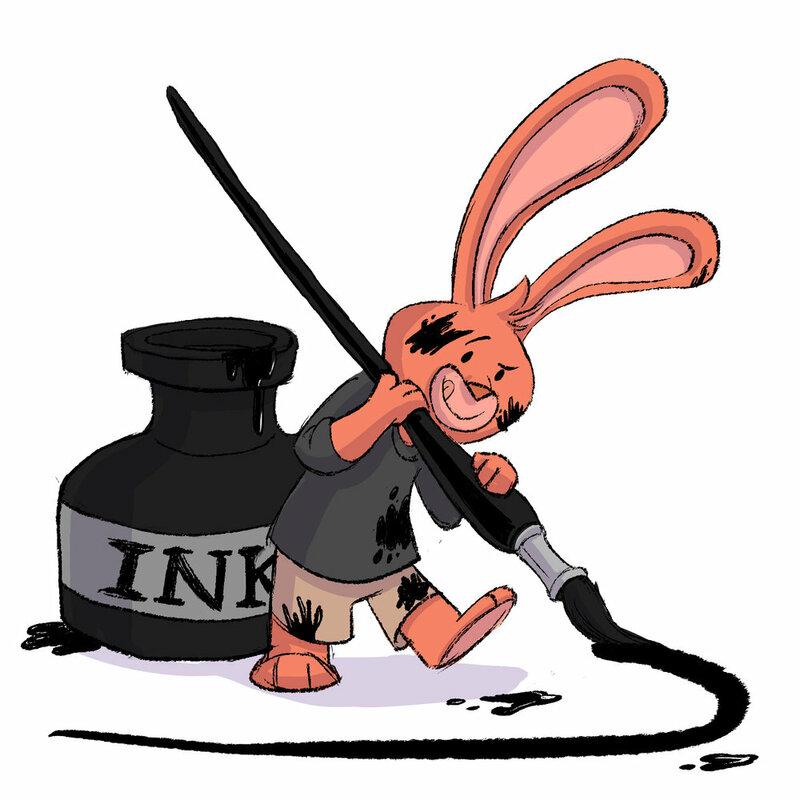 SVSLearn has inking classes, and right now we have a Free 7 Day Trial going on. Be sure to check it out! Have you guys ever done an art challenge? Will created the Draw 50 Things Challenge, it’s a design challenge where you try and create an illustration that has at least 50 different recognizable objects in it. Lee once did a 14-week long art challenge, painting a digital landscape every single day, 7 days a week. Which is a TON of painting! Drawing challenge: you do something daily or you have a project you try to finish in a certain amount of time. Take something you want to get better at and do it every day, for 30, 50 days. Jake created Inktober, which is where you create an ink drawing every single day during October. He also created the Draw 100 Somethings challenge, which is where you draw something and then draw 99 more different somethings, all within narrow constraints, such as 100 different dragons, 100 different pirates, 100 different animals, etc. The key is to not be too broad, the constraints will push your creative muscles! Improve your life, and become more creative. Improve your habits and develop your craft. It is so important that you do it everyday, at first it’s really awkward and it takes time to get in the rhythm, but eventually it becomes second nature. When you first try something, it’s harder and then when you do it again it gets easier. Repetitive attempts drill it into you. You will become a better and more creative artist by the end of the challenge if you really do it justice. While in college, Will got let into the illustration program on probation. He had to prove himself during the next semester to stay. He kept asking professors what he needed to work on and ultimately it was design. That’s why he made the Draw 50 Things Challenge, to help push people to sharpen their design and creativity skills. Lee created the Slowvember art challenge. You create something every day for Inktober and it is really fast paced, then during Slowvember you slow down and spend time every day working to create and polish one amazing piece. Lee is an advocate for slowing down and doing things right. So many people can get paintings to 70 or 80 percent of where they need to be but it’s that last 20 percent that really pushes the painting to the next level and its that last 20 percent that takes the longest. Slowvember gives you the opportunity to push something to 100 percent! Inktober: you should have a vision for it. Think of how you can do it, have a goal. Don’t do Inktober just do do it, but make it specific and have a goal. Be deliberate. Don’t just swing at 10,000 golf balls, but have a specific target or goal you are trying to create, then swing for that. That deliberateness will help you learn and improve so much faster! Maybe you want to do quick 30 minute sketches for Inktober with a goal to get faster at doing quick sketches, then that’s great! Just make sure you have a focused goal and you will get even more out of it. Fhe vast majority of people who participate in Inktober are hobbyists, people who love creating but aren’t doing it professionally for their career. They come from all walks of life, from middle school to adults, who all like drawing and being creative. Proportionally there aren’t as many professionals. If you fall into that category then for you it doesn’t have to be good it just has to exist. You’re building a habit of drawing and you’re trying to build the creative mindset. It gets you thinking. After 7 days you start to run out of ideas, and you have to push yourself creatively. There is value in just doing it, even if it’s not amazing...yet! Are You Allowed to Do It Digitally? Do you think that the guy with the turkey feather guy got mad when the guy with the metal nib pen came and drew next to him? Will: Art is art, the tools don’t matter. It’s about what you make and how you make the viewer feel. The problem with digital is when you don’t understand the traditional medium and the look that you are going for. When you know how to do it traditionally, then you can recreate that feeling and look digitally. Lee’s Challenge to Digital: Do half digital, and half traditional. That way you will get pushed and those two halves will begin to complement one another. Jake was blindsided last year by Inktober controversy over digital vs. traditional. Jake lives in both the traditional and digital world. He sees digital as valuable and the best thing that has happened to art; and that tradition is valuable and the best thing that has happened to art, there wouldn’t be any digital without it. Inktober was created to focus on linework, without the extra pressure of worrying about color. You can still do that challenge with a stylus, you can still make it simple and beautiful digitally. There are certain lines you can’t do digitally that are easier to do traditionally, learning to create those lines digitally is a skill in and of itself. There is value in doing the Inktober challenge digitally. It’s a different skill. However, there still are things to learn from stepping away from digital and doing traditional. Jake did a post encouraging digital artists to do traditional, that offended some people. People took it as him saying that they wouldn’t be getting the full experience. However, there is value to both digital and traditional, they both have their virtues. Jake didn’t mean to invalidate people. Jake took Inktober on as a personal challenge. Lately Jake has tried to ink digitally more with the iPad and Cintiq, and saw how there is something special to digital, both traditional and digital are so useful. Still, the drawings should be simple with just line work and maybe a splash of color, not full color paintings. If you normally work digitally, try it traditionally! Inktober, all about doing it daily and improving as an artist. Will: Don’t worry about what others say Inktober has to be. You can try to be different. There is no Inktober police. When people are saying you’re doing something wrong then you are on to something. After Picasso got others to start doing Cubism, a Cubism group quickly emerged and they kicked him out, however now he is the only one that is well recognized. You don’t want to be an “if only” artist. You don’t want to be an artist who can draw “if only” they have the right gear with them. You want to be able to draw with anything. You don’t need all this stuff. Inktober for writers: There was a writer who writes a little story to go with each daily prompt, and there is a group of writers that have gotten together to share their Inktober stories. That’s great! Well if Inktober means that you can just do anything, then it doesn’t mean anything. There is a reason for it, but you can be creative and do what you need to do. Zebra, Adobe, Pentel, Blick, and Kingart are all doing Inktober contests. There are contests. It could be that they are looking for traditional instead of digital or a dash of color. If you are going to enter contests, be careful that they don’t own your work. Pentel did a contest, they said that they own your artwork. They said that you could use it for anything they want to use it for. People were upset with it. 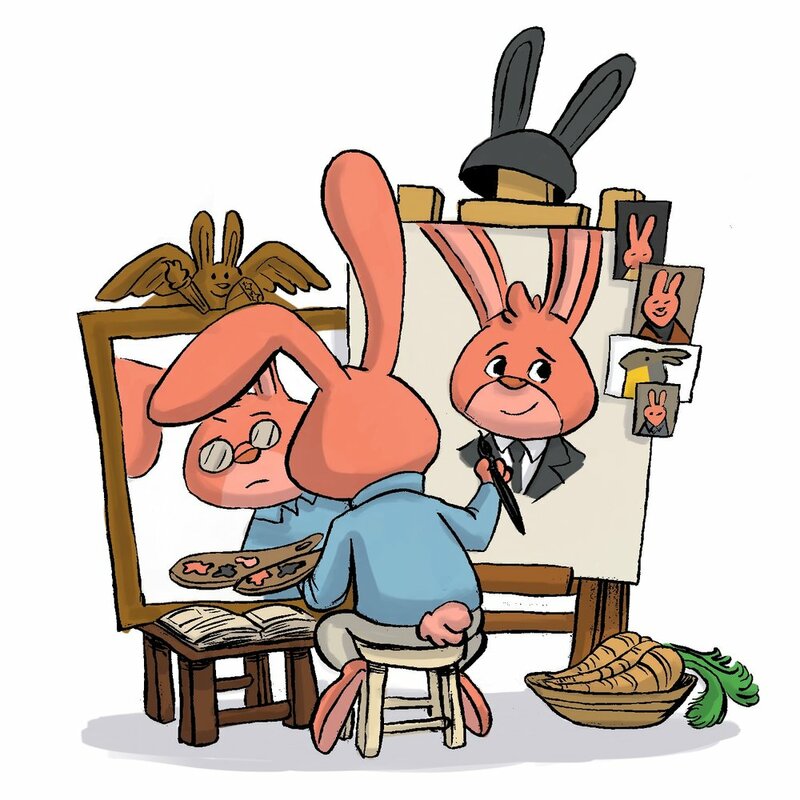 Their lawyer looked at it and Inktober’s lawyer looked at it, and it has specific wording to be able to use that work to post it and share it on their channels, not to use to advertise on their products. They went in and adjusted some wording. Really be aware of what the contest rules are, just be aware. If the contest is worth it, then maybe do artwork specifically for the contest for exposure. Instagram, Facebook, Twitter has similar wording to these contests. There are some risks and things that you just have to deal with, that’s just apart of being an online artist. Jake never would have imagined that Inktober would have turned into what it is today. Accountability, he tries to be a person who does what he says he’s going to do. Wanted a way to get more exposure as an artist, and a reason for people to come to his art blog. Inktober is still all about getting better at art, and getting people to want to come look at your work. Inktober has changed a lot of people's lives, got them in the habit of drawing, and boosted their followers. Inktober is like New Year’s, it’s a time when people say, “I’m gonna do it, I’m gonna make it happen.” It’s a line in the sand. Happy drawing! Thank so much for listening! What is The Creative Bank Account? We have mentioned it a lot in past episodes and it’s about time we talked about the source of all good ideas: what it is, how does it work and what are the best strategies for filling your personal creative bank account. A creative bank account is something that everyone harbors in their own minds. It is creative capital and you spend this creative capital every time you make something. Creative capital fuels all creative work: poems, drawings, artwork, writing, etc. We are unable to create in a vacuum or closed system. We need inspiration and stimulus from outside sources to fuel our creativity. That’s where the need for a creative bank account comes in. Steve Jobs said that creativity is about connecting the dots. Begin by drawing two dots. Connect the dots. Then draw another dot. Connect them again. Draw ten dots. Connect them in any way. What is the outcome? This illustrates how as ideas come together it helps to create something new. The more dots you have, the more creative options and combinations you can create! Innovation and ideas occur at an exponential rate. What are the best ways to fill a creative bank account? Expose yourself and put yourself in the position to be around inspiration and creativity. Lee has just joined a collective studio that has bakers, architects, artists, and graphic designers under the same roof. It allows him to be around more creative energy than he would be at home or in an isolated studio space. It doesn’t matter where you are as long as you are “collecting your dots” and filling your bank account. The internet allows you to fill your creative bank account anywhere. Indirect Experience - Experiencing something through the filter of someone else i.e. film, music, movies, libraries and Pinterest. You are seeing and experiencing someone else's perspective. This allows you to be up to date and aware of what’s going on in the world around you. Direct Experience - Personal experience i.e. travel & exploring. It physically gets you out of your space. Libraries allow you to be exposed to material that you would not normally read or see. Interact with the world around you. Venture to new parts of the city and new places you’ve never been. Undoubtedly, there will be something for your creative bank account. Lee was having a really tough time feeling creative after several months of getting his house ready to put on the market, then he had this cool experience with with his son by randomly deciding to check out a comic book shop called Cosmic Money. He hasn’t really ever liked comics, but after going into the shop they found an amazing graphic novel that re-sparked his creativity. Get out into the world and experience life! It really doesn't matter where you live. There are experiences in rural areas and experiences in cities that fill creative bank accounts. However, being able to interact with other people more can give you a lot more opportunities to fill your creative bank account. It’s all about being proactive. By reading three different books at the same time you will see different dots and find connections that you might not have seen if you were to read them one at a time. Regularly set a date and set time aside to take yourself out on an artist date! Get out of your own space and normal habits to go to an art gallery, a museum, a bookstore, or out into nature. Go by yourself so you don’t have to filter your experience through someone else. To have direct experiences travel, explore, do community service, go to museums, etc. Community service allows you to change your outlook and puts you in contact with people or situations that are outside of your normal routine. Visiting family pushes you to be in contact with people that have different opinions and perspectives than you. You don’t know what will inspire you! Who knows, maybe your crazy Uncle Joe will inspire a new character. Change the way you do things, like travel from place to place or where you create. Take a different route home. Surrender control by getting rides with family on vacation instead of renting a car. Change your mode of transportation. Will says that changing your daily routine is a boost for your creative bank account. You don’t always see all the benefits of these experience all at once, but, if you are deliberate, over time you will notice the effects. Share what you experienced. Talk to someone, write a blog post or journal about it, condense the experience to a phrase/ tweet. Take time to think. Will goes on bike rides or hikes almost daily. Jake and Lee like to run. Take time to listen to your thoughts. We spend so much time consuming that sometimes we don’t allow time to think and process. Keep a sketchbook or idea book. Jake started keeping one in the early years of his career and would write down any ideas he had. Looking back on it now, there are lots of dumb ideas but also lots of nuggets that help spark creativity in his art now. The book, “Choose Yourself” says to write down 10 new ideas a day. Jake has tried it and it’s hard. It really stretches you. Try it out! Creativity is a muscle - the more you use it, the better you get at it. Some ideas will be really dumb and silly, but still write them down, the good ideas will come. You can write down ideas for art, for new places to walk your dog, for a business opportunity you think Amazon could take advantage of, etc. etc. You will become more creative! The more ideas you have the more you push yourself. Will relates this to children’s books. He has seen that people with lots of ideas rather than just one get published. You have to generate tons of material and then refine. Changing courses is part of the creative process. You will see what things work and what things don’t work and change gears accordingly. Don’t allow your sketchbook to limit you. Students sometimes feel as as if a sketchbook needs to be perfect but Lee recommends calling it an idea book instead. Then you don’t have to feel pressure that each page has to look amazing, you can have lists and stick figures if you want! Am I too old to shift careers? Am I too old to start as an artist? Am I too old to start this big project I’ve always wanted to start working on? Regardless of your age, you are probably comparing yourself to people older and younger than you, and wishing you had done something different when you were younger or feeling like you are so far behind. Didn’t start drawing until he was well into his twenties. Realized he loved drawing, and started practicing, went to art school, ended up getting a job at Lucas Film doing character design for Episode 3, and then became a lead character designer at Blue Sky. You don’t have to start in your late teens to make it. Didn’t draw in twenties, or teens. Wasn’t interested until he was in his thirties and started drawing. Applied to Art Center of Design and got accepted with a scholarship, moved to LA, and graduated when he was 33. Then started getting his first books when he was in his mid-thirties, and that’s not the end, it’s just an on going thing. Miyazaki, the Walt Disney of Japan, in animation all throughout career until 40. That’s when he decided to start his own animation studio. He did a graphic novel at age 40 for Nausica that he wanted to make into a feature film, all of his great movies were done in his post 40’s. At age 40, you still have 25 years till most people retire, that’s a long time! You really don’t ever have to retire. Art isn’t like playing football, it’s not hard on your bones. Greg Manchess was winning awards and competitions for years, and he came out to do a lecture, he had just done the cover for “Above the Timberline.“ Speaking of that painting he said, “10 years ago I could not have painted this” even though 10 years ago he was winning awards for the Society of Illustrators, etc. If you really are serious about being an artist and creating the best art you are capable of creating, you have to make it a lifelong goal. It’s not a sprint. You need a schedule for yourself. You need to have an actual goal, something to look forward to. Without it, nothing happens. Don’t judge results by if you are right on target. Say, you’re 35. 5 years will pass whether you like it or not. You’re gonna be 40 at some point. Wouldn’t you rather have done something interesting with those 5 years between 35 and 40, or and tried to do this thing? If time passes anyways, you might as well do it. If you are starting later, you won’t be creating the same work that you would if you had started younger. You have had so many life experiences: losing jobs, family, work, etc. Beauty of age, experience, which leads to more informed art. If you’re older, you’ve figured out how to work and developed a good work ethic. You don’t quit until the job is done. Broader perspective, more interested in learning than instant gratification. Gina Jane- was a student going back to school. She turned in some of the best projects in the class, she had done a lot of graphic design stuff but hadn’t been drawing for a while. However, she had the work ethic, and she worked so hard at applying what she was being taught. She easily turned in some of the best pieces in the class. You can accelerate your learning with your experiences. Older students are more okay learning something without instant gratification. i.e. learning perspective, having a more broad perspective and being more willing to learn. For someone starting at, let’s say, 35-36.. Draw for 2 hours a day. Enroll in an online school, SVSlearn, schoolism, CGMA. Fill 6-7 100 page sketchbooks, during your 2 hours a day. Work on hands, head, the figure, landscape, perspective, shading, this is your your sandbox for practicing and applying what you are learning. Pick 5 of your favorite artist, do 20 copies from each of these 5 artists. Each copy, you will learn so much from trying to deconstruct what these artists have done. You want to learn how that artist did it. You’re gonna fail with some of them, but you try and learn from the masters by copying their work. Depending on what your goal is, it might change your approach. Seek advice from a professional: "these are my goals, what should I do?" Sometimes students want to become a children’s book illustrator but don’t really know any illustrators. During this first year, you need to educate yourself on this field. If it’s children’s books, every week maybe read 5 a week. If it’s comics, know what’s in comics, not just 20 years ago, but what is happening now. Fill your creative bank account with what people in the industry are doing. State your goal publicly: and then share your progress on the social media platform. That’s your Phase 1/ Year 1, it might take 2-3 years. Intermediate classes, these online schools, and svs have more advanced classes. More one on one with teachers. 4 sketchbooks this year, not studies, concept art for portfolio. Comic artist: ideas for characters, your take on Wolverine, etc. Complete the Draw 100 Somethings Challenge: boats, trees, flowers, gummy robots, dinosaurs, robots, etc. Teaches you to not be satisfied with first 2-3, or 20 designs. Teaches you that true creativity comes after you have drained all the low hanging fruit. Jake did 200. Just to prove that there is no end to the ideas you can do. Continue Studying. 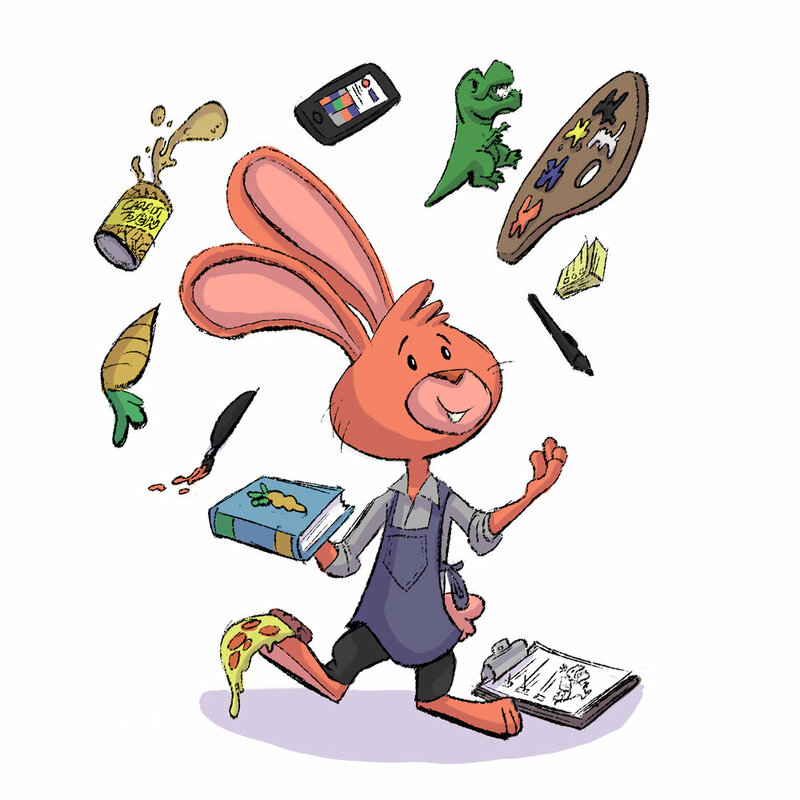 If you’re aspiring to do childrens books- keep studying children’s books. concept artist or animator-reading every word in the “Art Of” books. Comics, keep studying comic books. Social Media- post your 100 somethings. Post your sketchbook studies. Can start growing a following, cause you aren’t just practicing but sharing your own unique ideas and what you are bringing to this field you are entering. Choose your heroes. Educate yourself on what you want to do. i.e. children’s books, comics, animation. Post regularly, share your work, journal chart progress, share what you’re learning. Start to pay attention to stories. At the end of the day this is what will separate you. See what the story is about, not just the details, separate that. Eventually everyone will be able to draw and paint, and story is what will separate you. Ultimately, Star Wars is all about a family. It’s a family drama, that’s what it is about. Be able to see the broader view, what’s the story about, and how did they tell that story. You can really get some great insights to storytelling, story building, and how to tell your own stories. You don’t want to just be a vapid artist who isn’t saying anything. Key: Ultimately, it is your stories that you tell that will separate you from the others. Be observant of stories in your life and all around you. What the story is all about, what is the broader view? How did they tell the story. Look at it separate from the details. They’re not saying anything, or they’re saying the same thing that has always been said. Be conscious of the style that you are developing. Phase 3: Make a Product. Kickstart and Create your comic, illustrate your book, concept out your idea. Create something that works for you. Teaches you to Start and Finish a project.An actual product, suggests a finality to the project. Not just a project. Finished not perfect. Learn who prints things, and how to get things printed. Learn about how when things get screwed up how to fix it? You’ll be more educated and understand what’s happening behind the scenes. Year 3 is all about taking everything you are learning and create something with it. Enter contests, put yourself out there, step up to the plate, try it, and get work out there. This is the best that I have got, this is what I have to share. Helps propel you to a new step. Do your best, and then move forward. Keep finishing things, then you go on to the next thing, and keep doing your best, then you can decide where to go next. Don’t just keep a bunch of unfinished things in the drawer. Ultimately, we want you to teach yourself how to finish and present something. This will also help you flesh out a network. If you want to be successful, you need to build a network. People above, next to, and below you.You’d be surprised at what jobs and opportunities will come. Someone above may like your work and throw you a bone. Someone next to you may recommend you for a job. Someone below you has opportunities too. Start building that network by building things and putting them out into the world. Get into the network/world that you hope to enter. Project creates a connection with people in that world, starts a network. Study a film a week, a graphic novel a week, etc. Will used to have though that “If I look at other people’s work I would be copying.” Originality comes from taking and combining, and studying. Will wishes someone would have grabbed him and told him that. Keep feeding yourself. All creativity is, is connecting dots. Connecting dots that other people wouldn’t haven’t thought to connect. In order to connect dots, you have to have dots in the first place if you’re not filling your brain, then you have no creative capital to work with, you have no thoughts. You have 4 hours in a day. You work for 9-10 hours. You have 14 hours. Maybe you shave off an hour of sleep, maybe you stop watching a TV series. It really comes down to what you want to sacrifice. You shouldn’t sacrifice family, or your job. But there are some things you need to sacrifice to go down this path. Maybe it’s not 4 hours a day, and it’s 2. You can get a lot done in 2 hours. If you don’t prioritize it, it will never happen. Come up with a schedule. Maybe it is Thursday or Saturday. Jake gets up at 4am to work on Skyheart. Lee wakes up at 5, works from 5:30-9:30 or 10AM. During that grouping of hours, stuff happens. You can get a ton of work done in that group of time. Pursuit of Happiness. The main character would drink less water, so that he didn’t have to use the restroom as often and could therefore make more calls. You’ve got to ask yourself, how bad do you want something? It comes down to that. I really want to play the guitar, but I didn’t sacrifice for it, I didn’t prioritize it. I said that I really wanted to play the guitar, but if you don’t sacrifice and prioritize it, then you don’t really want it. You can’t have good things without some sort of sacrifice or some sort of skin in the game. She had a full time corporate job, and kept her job until eventually she hit the tipping point and she quit her corporate job, and now is an incredible illustrator. Jake: Skyheart, 60 Pages left to color, it’s coming along well! Lee: Working on illustrating some different subject matter. Do rough sketches, then Find 3 key beats or difficult passages, and does an illustration of those passages, cause that will set tone for the rest of the book. Not just page 1, 2, etc. and does those pages and then it influences all the rest of the pages. Will: Wrapping up Texture Painting class, Finished up the Alice in Wonderland series for Comic Con, and just finished a children’s book.